Veteran gardeners will tell you that soil testing is an important part of raising greener, healthier plants. Whether you are expanding your lawn, planting a new bed of ornamentals, or trying to figure out why your citrus leaves are off-color, a soil test is worth the effort. Why? Soil testing takes the guesswork out of fertilizing needs, how to address micro and macro nutrient deficiencies and other issues that negatively impact plant growth. What do soil tests tell you? First, let’s address what a soil test can and cannot do. Garden soil testing will not provide answers about insect infestations, drainage problems, inadequate sunlight or specific plant diseases. So, it’s a good idea to rule these factors out first when evaluating why plants aren’t thriving. Soil testing is designed to give you a snapshot of the overall health and fertility of your garden or lawn dirt. These tests identify nutrient levels as well as how alkaline or acidic the soil is. The majority of plants, including flowers, vegetables and grasses, grow well in slightly acidic soil that falls within a 6.1 to 6.8 pH range. Soils that are more alkaline, or extremely acidic are not conducive to a fertile, happy garden because the soil pH impacts nutrient availability. If the pH of your soil isn’t desirable, your plants simply cannot process phosphorous, potassium and other nutrients, thus hampering their growth. Soil testing for pH lets you take corrective steps (if needed) to lower or raise your pH to an optimum level. Soil pH can be raised by adding lime or lowered with powdered sulfur. A comprehensive soil test will measure levels of potassium and phosphorous, two nutrients that affect root growth, protein synthesis and overall development. Nitrogen, although crucial for plant growth, is not measured in soil tests since it is readily lost from soil and levels fluctuate according to microbe activity and moisture, making an accurate assessment nearly impossible. Soil testing can be done once a year in healthy gardens, or anytime it’s needed. For more accurate and representative results, it’s best to gather soil samples from several spots in your garden and mix them together. 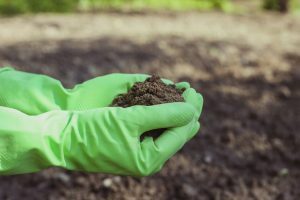 Avoid collecting soil that has been recently fertilized, or taking samples close to a compost bin. Using a trowel, cut a wedge of soil at least 6 inches deep. Let it air dry before placing in the bucket or provided sample container. If your samples are being sent to a laboratory for professional assessment, you will receive a detailed report containing recommendations for correcting nutrient imbalances or pH levels. Phoslab garden soil testing services in Florida lets you manage your crop growth and plantings with knowledge and confidence. Soil tests are a valuable investment for anyone with a home garden, as well as commercial turf, commercial produce and field crops. To learn more about our soil testing services, please call (863) 588-7384.